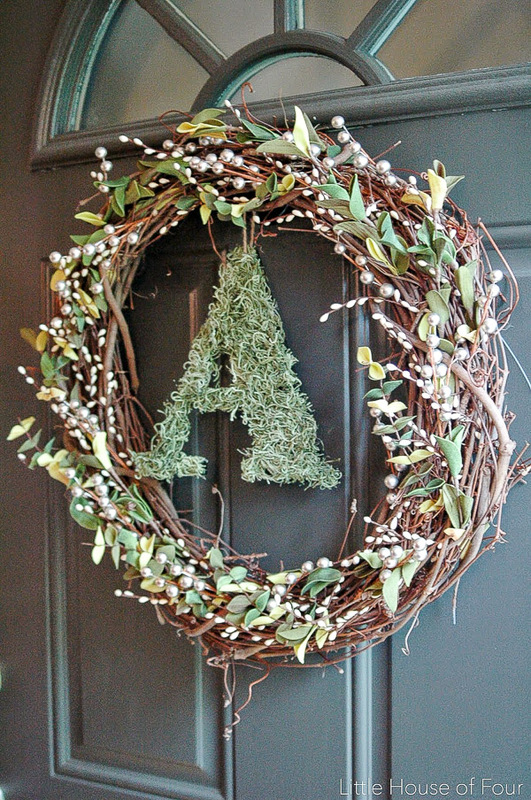 A moss covered initial wreath perfect for fall! I know, I know, it's not even September and I'm already talking about Fall. Hey, at least I haven't gone straight from Summer to Christmas like the department stores. In my defense, school started yesterday and in my eyes, that means Summers over. Whomp, Whomp. I guess I can't complain too much since Fall is one of my favorite seasons to decorate for and I just can't wait to get started on my long list of projects. While on vacation a few weeks ago I took some supplies with me to start working on my Fall wreath, particularly covering up this plan boring letter "A" with some moss. I've never worked with moss before and had no idea it would make such a mess. Looking back, I should have did this project outside to minimize the clean up. It looked like a chia pet until I gave it a good trim. Once I got home from vacation, I worked on assembling the wreath. I picked up a few Fall picks from the craft store, which I pulled apart and stuck in the wreath one at a time. 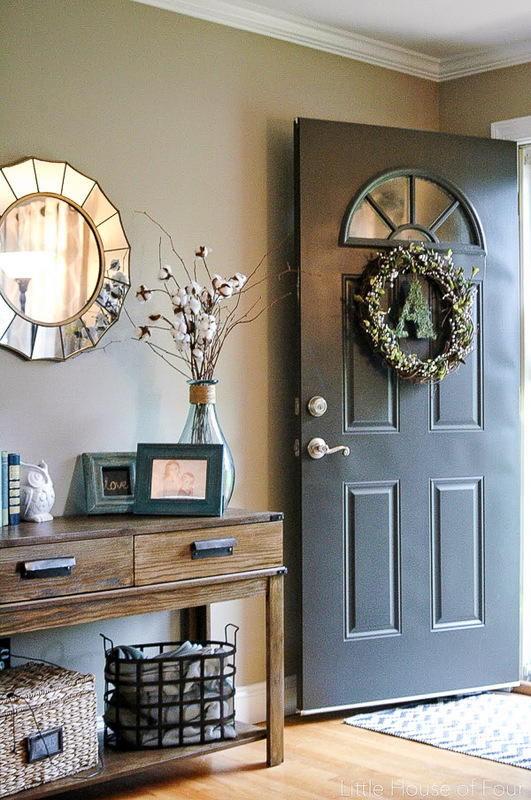 I love how the colors blend in so well with the entry and living room decor. I may even keep this wreath up all year long! Can you see the dents in the door? Our current front door is metal and that's the whole reason why our new door is fiberglass. We actually have the new door sitting in our shed and I can't wait to get it installed. It's a craftsman style door that I think will change the entire look of the front of the house. It's the exact door I wanted for our mudroom entrance, but my husband had strong opinions on wanting an all glass door for the mudroom. I figure since he lets me make all the other decisions, I would give in to his one request. I hope he doesn't expect the same compromise with the kitchen. If he's claiming the garage, I'm claiming the kitchen. LOVE this wreath Katie & cannot wait to see it hanging on your new front door! You and me both! It's KILLING me having the door and waiting to get it installed! I laughed when you said chia pet....that is so true! Your wreath looks just great! I am still on the fence about Fall. Here temps are still hitting the humid high 80's but I have all my Fall stuff laid out in the basement ready for ideas. Thanks Christine! It's still hot and humid where I am too, but I can't wait to start decorating for Fall. My dining room table is covered in projects! Thanks Kendra! I'm dying to get the front door installed and painted and can't wait to share. So cute! Thanks for sharing, reminds me I need a new fall wreath! Thanks for stopping by, Jenni! I'm glad I could inspire you to get a new wreath! Love your chia pet ~ I mean awesome wreath! ;) The little white berries really pop! I want a new wreath every fall and I love how you made this one...I think I will have to copy.